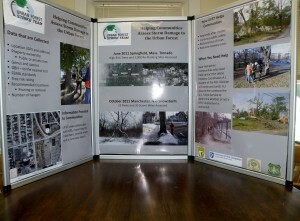 Urban Forest Strike Team | Massachusetts Tree Wardens and Foresters Assn. Natural disasters cause significant damage to urban forests every year, and the resulting assessment and cleanup responsibilities are a challenge for many communities. The Urban Forest Strike Team (UFST) program was developed by state forestry agencies and the U.S. Forest Service in the Southern region (Region 8) and is now being implemented in the northeastern and midwestern states (Region 9). Urban Forest Strike Teams provide professional recovery services to communities following ice storms, hurricanes, and other natural disasters. The UFST process includes recruiting, training, and deploying professional urban foresters and arborists to assess tree damage using FEMA and tree risk assessment standards. The assessments help communities plan needed recovery work and document the amount of damage and cost of clean-up. Beginning in 2009, the Forest Service has partnered with the Massachusetts Tree Wardens and Foresters Assn. to help expand the UFST initiative to its seventeen-state Northeastern Area. Under the cooperative agreement with MTWFA, federal monies have funded training sessions for NA team task specialists and team leaders, and deployments to assist impacted communities in Massachusetts and beyond. The goal of the UFST program is to provide assistance in planning, response, recovery, and mitigation of the urban forest following destructive weather events. Tasks performed by Urban Forest Strike Teams may include: rapid tree risk assessments of damaged, standing trees; debris estimation assistance for communities or state emergency management agencies; identification and evaluation of tree planting sites for short and long-term recovery; and training of additional qualified local and state arborists to assist in disaster situations.